I gained a lot of knowledge about keying, color correction, retouch, 2D-3D element integration, 2D-3D tracking, continuity and so on. This is a simple node disable tool, it's useful if you have a lot of VectorBlur in your graph :). 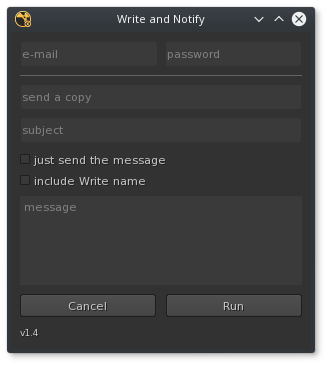 I share my new messaging plugin on nukepedia and GitHub. Hurray!!! When your render is done, the tool sends you a notification. The tool currently works with g-mail and yahoo accounts. Available on Nukepedia and GitHub. I didn't find other solution for this. Hi, I'm Levente Vass. I currently work as digital compositor at UPP. This Blog created for compositing things.